Introduced in 1999 as a 2000 model, the S-Type marked the first time since the 60s when Jaguar offered more than one saloon line to its customers. The newS-type was a radical departure from the existing XJ line not only because of its size but mostly for its styling. Known under the project code name of X200 before its presentation, the S-Type surprised many with the numerous styling clues from its namesake, the original S-type and Mark 2s from the 60s : rear roofline, vertical grille, headlight shape, etc.. Priced about $ 10 000 below the XJ8, the S-type's interior still features real wood veneers and Connoly leather used in more contemporary fashion. Under the bonnet, buyers could choose between a new 3 liter V6 or the same 4 liter V8 used in the XJ8 and XK8. The substantially cheaper V6 drivetrain, based on a Ford engine and transmission, provides adequate power for the S-type but lacks the refinement of the V8 something first time Jaguar buyers would be missing on. However, it is the best selling S-type which largely contributed to Jaguar sales records in 2000. 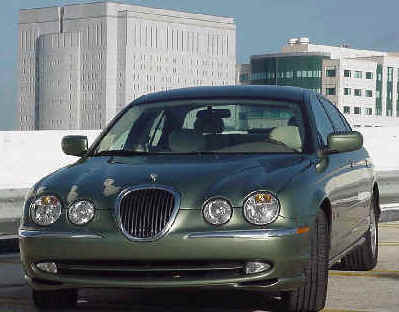 In 2002, a revised version was announced by Jaguar, to debut as a 2003 Model. On the outside, the 2003 looks almost identical to the previous version but the interior, engine ( now 4.2 liter), suspension and construction were heavily revised. As anticipated, an R model was also introduced, featuring the new 4.2 liter supercharged V8 mated to a ZF 6 speed automatic. 2004 would see the arrival of a diesel version, a first for Jaguar but a must to remain competitive in European markets. 2008 will be the final model year for the S-Type after Jaguar unveiled the all new XF Saloon in August 2007.